This issue’s article (at the end of this newsletter) is titled “All Methods are Vedic”, and discusses what is meant by a ‘Vedic’ method. This event will be on 16th and 17th March 2019. Everyone is invited to speak or watch, and as usual the Conference will feature speakers from around the world telling us of initiatives in various countries. There will also be VM Workshops, and presentations outlining recent research. which will be updated over the coming weeks as the details are finalised. We can find products using symmetry with the Sutra By the Deficiency. Suppose we require the product 29 × 24.
. . . . 30, 29, 28, 27, 26, 25, 24, 23, . . . . Noticing that 29 is 1 below 30 we may ask if we can get the product 29 × 24 from the product 30 × 23, where 30 is 1 more than 29 and 23 is 1 less than 24.
where the 1 and 6 are the differences of the given numbers (29 and 24) from the base number, 30. This makes such products very easy to find and is proved by: (B+a)(B+b) = B(B+a+b) + ab, where B is the base chosen and a and b are the deviations from that base. Similarly, if we wanted 28 × 24 we could again use 30 as base, and to preserve symmetry we would need to pair it with 22 (2 below 24). Then 28 × 24 = 30×22 + 2×6 = 660 + 12 = 672. 58 × 63 = 60 × 61 – 2×3 = 3660 – 6 = 3654. This method is useful in permutations and combinations where the product of a series of numbers is needed. To find 33P4 = 33×32×31×30, for example, we easily get the product of the outer pair of numbers to be 990. The product of the inner pair is then 2 more by the above method, i.e. 992. 990×992 is easily found using a base of 1000. So 33P4 = 982080. "Powers of 9" by M Rajagopala Rao. This paper shows how the coefficients in Pascal's Triangle can be used to easily obtain powers of 9. Sri Bharati Krishna Tirthaji was the 143rd Shankaracharya at Puri, India. In 2008 I had the opportunity to put some questions on Vedic Mathematics to the 145th Shankaracharya at Puri: His Holiness Jagadguru Shankaracharya Swami Nishchalananda Saraswati. These comments and others indicate that Bharati Krishna considered there is a distinction between Vedic and non-Vedic methods. So the question naturally arises as to how these two enlightened gentlemen could be contradicting each other, if indeed there is a contradiction. This apparent paradox can be resolved by considering that there can be a scale of ‘Vedicness’. That is, that one method may be more Vedic than another, or less Vedic. So when Bharati Krishna (e.g. Chapter 28) compares the ‘current method’ or the ‘usual method’ or the ‘conventional method’ with the ‘Vedic method’ it is simply a way of comparing a current method with a simpler one shown in his book. This is confirmed by statements like “All these methods, however, fall in one way or another, short of the Vedic ideal of ease and simplicity” (page 348, chapter 36). So we are led to understand that one method may be ‘more Vedic’ than another, with the ideal of ease and simplicity at one extreme. This means that we cannot say that this method is Vedic and this is not: only that one may be more Vedic or less so. c) one method may be closer to the Vedic ideal than another. … the Vedic system's Ideal of "Short and Sweet". … the Vedic ideal of ideal simplicity all-round and which in fact gives us what we have been describing as "Vedic one line mental answers"! 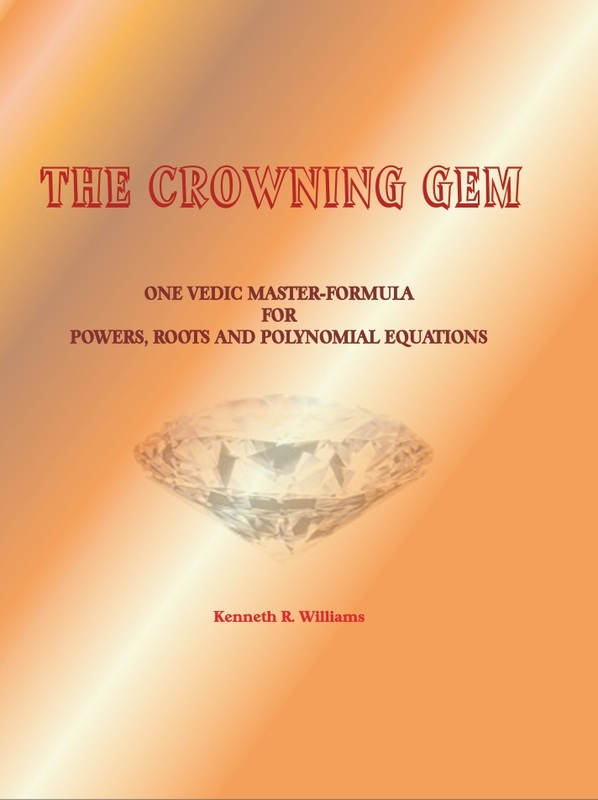 … the Vedic ideal of the at-sight mental-one-line method of mathematical computation. … from the Idealistic Vedic standpoint. … the highest Idealistic ideal of the Vedic Sūtras. To summarise then we may say that any method that correctly solves a problem may be classed as ‘Vedic’, but some methods are more Vedic than others. The closer a method is to the Vedic ideal of ease and simplicity etc. the more Vedic it is. 1 All references are to Sri Bharati Krishna Tirthaji’s book “Vedic Mathematics” first published in 1965. Page references are for editions prior to 1992.